I can’t remember ever seeing Bubbles in any of my local arcades, and I never heard of it when people get all nostalgic about the ‘good old days’ of arcade games. So imagine my surprise when I cracked open my copy of Midway Arcade Treasures and found this game staring back at me. Protip: It wasn’t the good kind of surprise. In Bubbles, you play as a soap bubble (probably named ‘Bubbles’) that is tasked with cleaning up a series of sinks. You can absorb (i.e. clean) anything smaller than you which will make you grow slightly. Clean enough things and the drain in the middle of the screen turns green and you go down it, somehow ending up at the next sink. Hit a cleaning brush, or something bigger than you, or something sharp (like a razor blade) and you pop. (Popping = you dead). You keep going until you either run out of lives or run out of interest with this game. Both of which I’d suspect will happen relatively quickly. 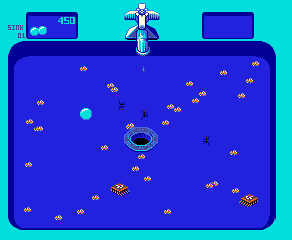 The main problem I have with this game is that the controls are a bit… erm… slippery. I suppose that’s the nature of controlling a soap bubble with a face on it, but it makes the game much more frustrating than it needs to be. Playing for about 10 minutes, I was able to discover why I never saw this game in any form until over 20 years after it came out. While the 1980s were certainly a fantastic time for video games, and we got a lot of classic titles out of the boom, there were a lot of clunkers. This game included. This entry was posted on Thursday, August 9th, 2007 at 10:13 am	and is filed under Arcade, GameCube. You can follow any responses to this entry through the RSS 2.0 feed. You can leave a response, or trackback from your own site.